When you add a modern page to a site, you add and customize web parts, which are the building blocks of your page. This article focuses on the Sites web part. The Sites web part allows you to automatically show sites associated with a hub site (when a hub site is in use), or a current user's recent sites (which are the same as those shown on the user's SharePoint Home page). If you have specific sites you want to show, you have the option to select those instead of automatically showing sites. When sites are shown in the web part, each will include the name of the site, a link to the site, and the latest activity for the site. Recent user updates and views are examples of site activity. Go to the page where you want to add the web part. If you're not in edit mode already, click Edit at the top right of the page. Hover your mouse above or below an existing web part or under the title region, and click . In the web part toolbox, use the search box to search for Sites. Then, select the Sites web part. When you are using a hub site, the web part will automatically show sites that are associated with the hub site that your page is part of. If you don't want that, you can select specific sites or the current user's frequent sites instead. Click Edit web part on the left of the web part to open the Sites toolbox. To select specific sites to show, click Select sites, and then search for the site you want to add, or select one or more sites from Sites associated with this hub, Frequent sites, or Recent sites. Then, select the checkboxes for the sites you want to show. 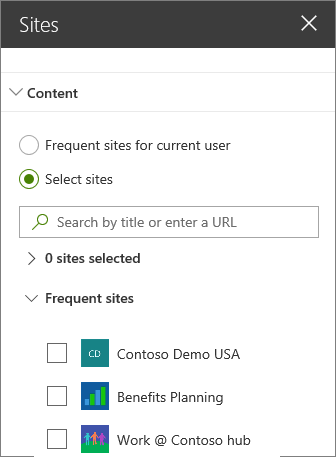 To show sites automatically, click All sites in the hub (only when you're using a hub site), or Frequent sites for current user (which displays the same sites as those on the user's SharePoint Home page). Click Edit web part to open the Sites toolbox. 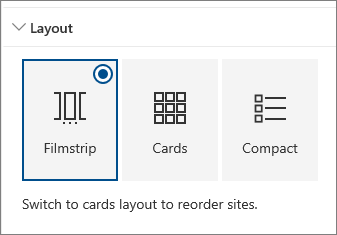 Under Layout, select Filmstrip, Cards,or Compact. Note that you can reorder sites only in the Cards layout. Under Layout, select Cards. You can reorder items only in the Cards layout. In the web part on the page, drag and drop the sites in the order you want.